It is with great sadness that the family of Lois Kennedy, announces her passing on August 24, 2018. She went peacefully to be with the Lord at the age of 80 at the Hospice House in Kelowna after a courageous battle with cancer. Lois was born to parents Wasyl and Vera Petriew in Radisson, Saskatchewan, on July 17, 1938. She is survived by her three children, Marva (Kai) Kennedy of Kelowna, Wayne Kennedy of Montreal, and Brian (Renata) Kennedy of Kelowna; her grandchildren Caitlyn, Ashton, and Kesenya; and her sister Eunice (Henry) Suderman of Saskatoon. Lois was predeceased by her husband Raymond Kennedy (2015), and brother George Petriew (2016). Lois grew up on the family farm north of Radisson, Saskatchewan. She met Ray while attending a Bible study in North Battleford, and they were married on October 6, 1962 in Radisson. 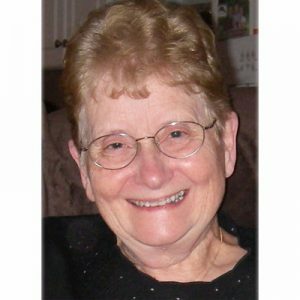 Lois graduated as a registered nurse (RN) from St. Paul’s School of Nursing in Saskatoon in 1960. She worked as a nurse, as a homemaker raising three children, and as a missionary’s wife at several remote locations across northern Canada. Lois later continued employment as an RN at various locations in BC and Saskatchewan. She often spoke of the many good memories she had while employed at the Saskatoon Veterans Home. Her friends and family will remember Lois for her selfless love, kind spirit, generosity and gratitude towards others. She enjoyed many hobbies: playing piano and organ, singing, knitting sweaters and afghans, quilting, crocheting, doing needlework, and making preserves, not to mention her fantastic Ukrainian cooking and baking. Her fresh-baked pies were always a huge favourite. Lois was often consulted for her practical advice and wisdom. She will be dearly missed. A funeral service will be held at 1:30 pm on Sunday, September 2, 2018 at the Dalmeny Funeral Home in Dalmeny, Saskatchewan. Following the service, the interment will take place at the Redberry Cemetery. An invitation is extended to friends of Lois Kennedy and her family to an informal reception at the Dalmeny Seniors Center (230 Ross Ave) starting at 5pm. If you wish to send a condolence, post photos, or to share a memory, please scroll down this page to the area called “share your condolences.” or by visiting dalmenyfuneralhome.ca. As an expression of sympathy, should family and friends so desire, memorial donations may be made to Northern Canada Evangelical Mission (ncem.ca), or GFA World (www.gfa.ca). The service for KENNEDY, Lois Petunia is scheduled for 1:30 pm on Sunday, September 2, 2018. Below you will find the map for the service location and the contact information should you have any questions.